Synopsis: The child star that was left behind is about to get her moment to shine in this swoony romantic comedy inspired by a unique, beloved facet of pop culture history: The Mickey Mouse Club. Holly Danner has a complicated relationship with fame. It's not easy being the only cast member of a 1990s song-and-dance show who didn't become famous. When she was eleven, she used to do anything for a laugh (or at least a laugh-track) on "Diego and the Lion's Den." If she talked about it--which she almost never does--Holly might explain how her childhood best friends came to dominate the worlds of pop music, film, and TV while she was relegated to a few near-misses and a nanny gig for her niece. She'd even be telling the truth about making peace with the whole thing years ago. But when she finds out there's a 25th anniversary for the show planned--a televised reunion, clip show, and panel--and she wasn't invited, it's time for an impromptu road trip to crash the event and set the record straight. Three problems: she's currently in Internet Rehab (perhaps she's not quite as well-adjusted as she believes...), she has no cash, and the only person who can get her across the country in time is Thom Parker, a handsome, infuriatingly level-headed patient who doesn't think she should confront her famous ex-friends. 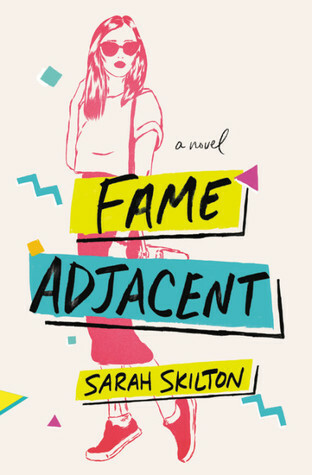 FAME ADJACENT is a contemporary, realistic, and humorous look at love, friendship, and fame, as seen through the eyes of a girl who lived it--from the sidelines. About the Author: Sarah Skilton is a book blogger with Barnes & Noble as well as the author of two young adult novels, Bruisedand High & Dry. Her first adult novel, Club Deception, was published by Grand Central in 2017. My Review: This was a great little story that was so cute. I had a fun time with the characters as they learned and grew throughout the story. And the addiction of the child star angle just made me think of those reunion shows that you see from time to time. I could see this one for those who are looking for something a little lighter this spring/summer. This was a very humors title at times and I really enjoyed how everything turned out. I think this one would make a great TV movie as it was just one of those get away from real life books. I would really like another title set when the main character was younger and on the actual show.
" Sarah Skilton on my insta-buy list!"